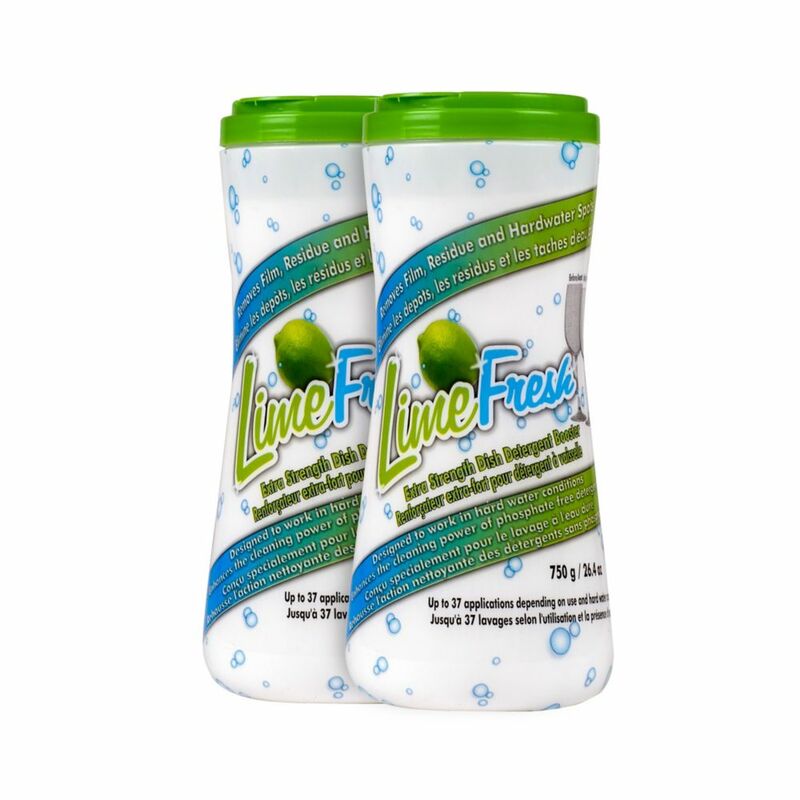 Fresh Products LimeFresh extra strength dish detergent booster fights the toughest film, residue and hard water spots, and leaves your dishes and glassware sparkling clean. Our formula powerfully combats stubborn film and residue and is designed to work in all hard water conditions. The extra strength power works on even the toughest problem areas. LimeFresh acts as a powerful shield to prevent the minerals in hard water from attaching to your dishes and glassware and it boosts the cleaning power of your phosphate free detergent. Receive up to 40 powerful applications in a single package and protect your dishes with our Phosphate free, environmentally friendly and biodegradable dish detergent booster. LimeFresh is septic-tank safe. Try our 2 Pack option. Cascade Cascade 2 In 1 Action Packs Orig. Fleecy Aroma Therapy* Calm combines all the softness you love about Fleecy* with a warm, calming scent. Fleecy Aroma Therapy* Calm envelops your laundry with the scent of vanilla and honey lotus to calm your senses while it softens. Fresh Products Disposal Fresh conveniently and rapidly cleans, freshens and boosts the performance of your garbage disposal. Our formula powerfully dissolves fatty deposits, food residue, and other odour causing build ups. Disposal Fresh utilizes new, pre-measured jumbo size disposal balls to make easy work of tough grime. It is incredibly easy to use - just drop it in, and let it do all the work. It will leave behind a clean and crisp orange-fresh scent. Disposal Fresh can be used once a week to keep you garbage disposal at maximum performance. It is safe to touch, no unwrapping is needed, and it uses no harmful chemicals. Disposal Fresh is environmentally friendly and biodegradable. 1 Package of Disposal Fresh contains 10 tablets. Extra Strength Dish Detergent Booster 750G - 2 Pack Fresh Products LimeFresh extra strength dish detergent booster fights the toughest film, residue and hard water spots, and leaves your dishes and glassware sparkling clean. Our formula powerfully combats stubborn film and residue and is designed to work in all hard water conditions. The extra strength power works on even the toughest problem areas. LimeFresh acts as a powerful shield to prevent the minerals in hard water from attaching to your dishes and glassware and it boosts the cleaning power of your phosphate free detergent. Receive up to 40 powerful applications in a single package and protect your dishes with our Phosphate free, environmentally friendly and biodegradable dish detergent booster. LimeFresh is septic-tank safe. Try our 2 Pack option. Extra Strength Dish Detergent Booster 750G - 2 Pack is rated 5.0 out of 5 by 5. Rated 5 out of 5 by Jl 59 from Shiny clean dishes I live in an area with lots of minerals in water. Dishes came out of dishwasher with white haze and felt gritty. An appliance salesman recommended this product. Works great! Dishes, silverware and stainless steel come out of dishwasher shiny. I use about 2 tablespoons per load. Rated 5 out of 5 by Happy Dishwasher from A lifesaver! I will not run my dishwasher without this product! No film nor spots left on dishes - just a sparkling, clean finish each and every time! Rated 5 out of 5 by readlisten from Astoundingly good product I have well water and the water is full of lime, sulfur, and iron. My water is brown and smells, depending on the time of the year. Dishwasher items came out cloudy, brown and still covered in food, UNTIL I began using Limefresh. This is a miracle product! It does exactly what it says it will do. Everything comes out of the dishwasher sparkling, clear and clean. Even the brown stain on the inside of the dishwasher is gone. I am gushing because rarely does a product work so well, and save me so much work and aggravation.